“Sabaidee! Sabaidee! Hello! Hello!” The local people shout; all smiles and big waves as you drive past them, through tiny villages and herds of cattle, past rural clinics and primary schools, along lakesides and in the shadow of mountains. This is how I fell in love with Laos and her people whilst a passenger on the back of a semi-automatic scooter. 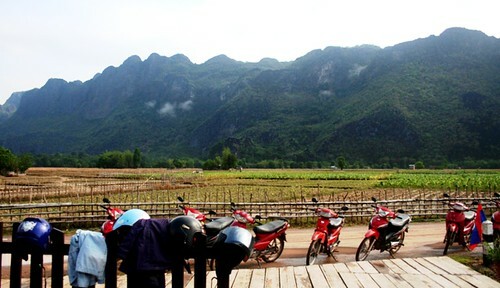 Some friends and I had heard from a few sources about the “Thakhek Loop” in Central Laos, an approximately 450 kilometre route said to take three to four days by motorcycle or scooter. We rented our bikes from a travel lodge in Thakhek, a town roughly in the centre of Laos, were given a rough map of the region and a very quick scooter lesson and were sent on our way. Little did we know but this three-day trip would be the highlight of our travels. We saw some of the most breathtaking scenery. Every few kilometres offered something different; from tobacco fields and farming villages to natural lakes and water buffalo. We stayed in a little guesthouse on the water’s edge and watched the sun go down and we spent a night in a home stay where dinner ingredients came solely from the back yard. We met some incredible people; from our riding crew to the local restaurant owners and the tour guides at the famous Konglor cave. Everyone was so welcoming. Make no mistake, the Thakhek loop is not for the faint-hearted. It is a long way to travel on a bike, whether you are a driver or a passenger. By day three, your body feels the distance. The roads alternate between tar and gravel. And you may have to sit it out for a few hours and watch a new road being constructed in front of your very eyes. You’ll be hard-pressed to find any luxury accommodation along the way but if you are simply looking for a clean bed and a shower, you’ll find plenty. In the end, it all adds to the adventure and camaraderie of the trip. 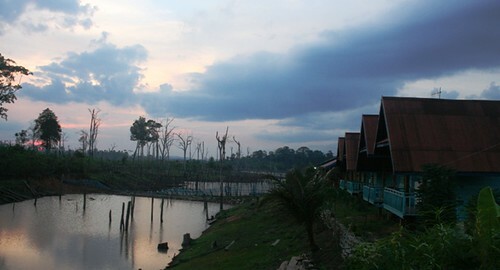 Laos has only recently become a top south-east Asian destination for travellers. This is the reason it remains relatively “untouched” by tourism’s greedy claws. Some say it is how Thailand was a few decades ago before McDonald’s and Starbucks, Contiki Tours and full moon parties, high-rise hotels and holiday homes. In Laos, you will rarely be ripped off or bothered for money. In the big towns and even in the capital, Vientiane, you will feel as if time stands still. If you visit this remarkable country, try to make sure you have time to enjoy the laidback atmosphere, taste the divine local cuisine and wander the streets. Best of all, rent a scooter and explore. You won’t regret it. It has been said that travel is not about the journey or the destination but about the people you meet along the way. Whether you tour the towns and the temples or the party spots and the hostels, the local people make Laos an incredible country for any traveller to visit.